I love to communicate. Communicating ranks high on my list, much to my families' (and a few friend's) frustration. When hosting a giveaway or the Friday advertising feature, nothing makes me happier than to hear your reaction as you're notified. Sometimes, however, locating you can turn into a meandering path which, believe it or not, ends with a dead end. This makes no one happy except for the alternate winner. 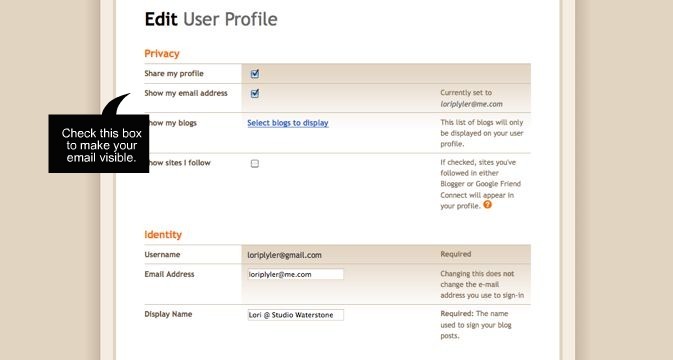 Log into your Blogger profile. See the "Contact" box? That's where your email will be. See the "Edit Profile" button? Click that little button. Under "Identity", you can enter whichever email you'd like to use. Then make absolutely sure that you click the box next to "Show My Email Address". Then you click save and voila! You're done. I can now contact you when you've won something - or I just need a shoulder. Just kidding about the second part. I'll not communicate my moans and groans. 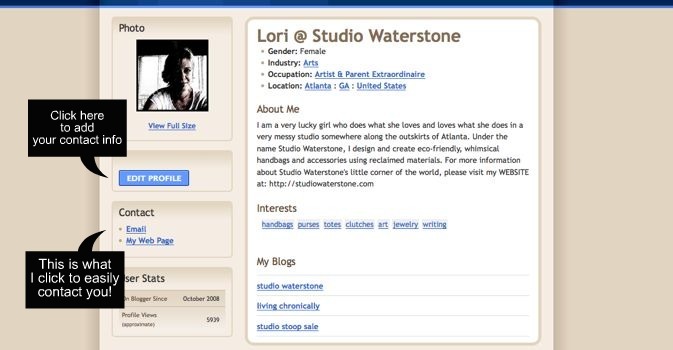 Great post Lori!! I have a giveaway coming up so I had to share your tuturial. I hope the winner I pick has contact info. I have seen a few entries that look like there is none, it's sad! Yes, I love to 'visit' with those who post on the blog, but some don't have email contact info. I now have a new blog and would really love to talk with those who are so kind as to leave a comment. Great tip! I get frustrated when I can't contact people who leave me blog comments, especially when they ask questions. I just double checked to make sure my e-mail address is listed. Thankfully it is! Yes, yes, yes! I have actually become pretty good friends with a blogger that I told how to do this! We have stayed in touch ever since! Thanks for that reminder Miss Lori! It makes me crazy when I can't hit 'reply' to respond to a comment. I am sure that those that never get a message back think I am the most terrible clod. But if I can't comment back it is like a friend goes missing. I never get spam from my email in my blog or comments. Blogger is pretty good about that. And my only requirement when I have a giveaway is that they either provide me a way to get in touch with them or turn on their email address! I think that many people don't realize that this is a setting though, so I am glad that you reminded them! Enjoy the day! Thanks for that tip! I hadn't reviewed my profile since creating it, and didn't know what settings were on.